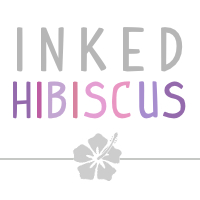 Inked Hibiscus: What's In My Bag? I've been toying with doing a post like this for some time now. 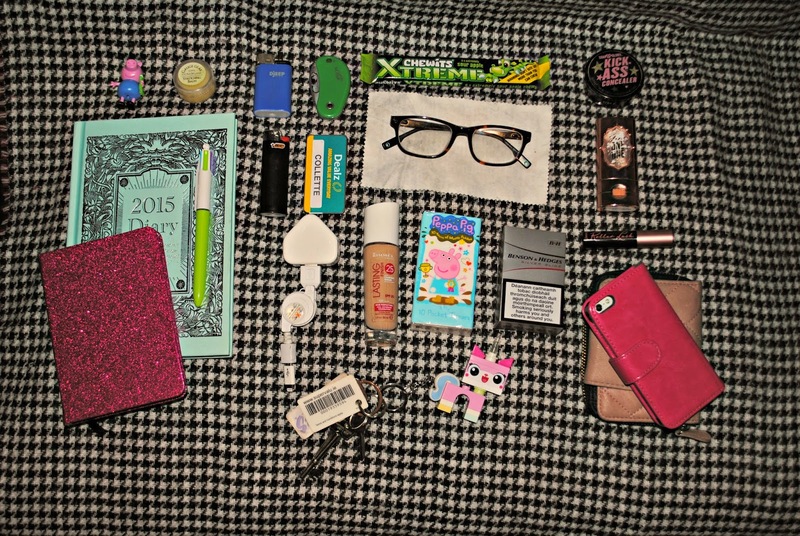 I mean, I'm incredibly nosy, and love seeing what's in other people's bags. 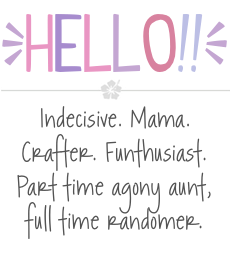 Even though the world and it's mother has done similar posts, I said I'd give it a whirl. Today, I found myself with a free hour so I decided to get cracking. Unfortunately, the weather didn't agree with me so I had to do my best photo wise! This is my bag in all of it's glory. It's just a cheapy from Penneys/Primark, but I think it's cute. I will say though, that while I love it because Caelen hasn't figured out how to open it yet, it's a little awkward when you're pushing a buggy and your phone starts to ring! It'll do for the time being though! For such a mid-sized bag, I tend to fit a whole lot in! On days I'm working, I have all this, and maybe a bottle of water or an Innocent smoothie stashed in. On days I'm off, there's a pack of wipes and a nappy taking up most of the room in my bag. Lately though, Caelen's taken to wearing his Toy Story backpack with his own little odds and ends. It feels so nice to have space in my bag now! First off, the necessities for a working day. 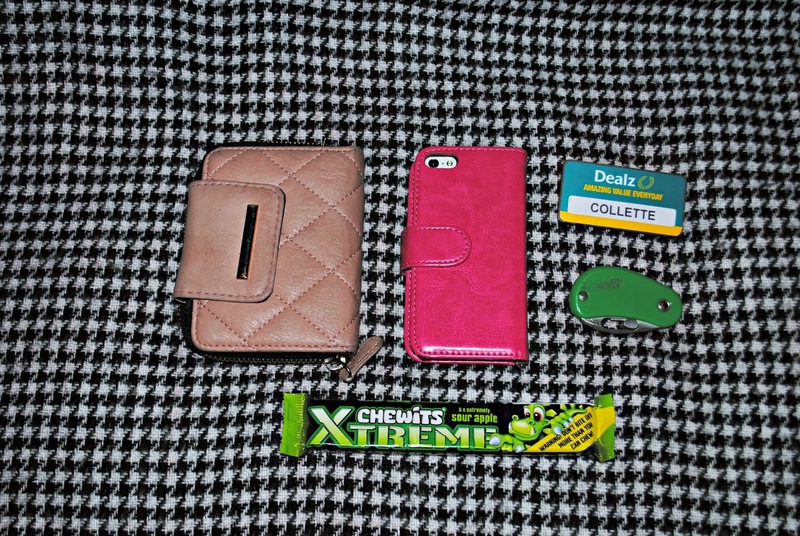 Purse, phone and work essentials. The purse is another bargain from Penneys/Primark. For years, I carried around a huge teal purse from River Island, until the change clasp broke. I can't justify spending so much money on a purse at the moment, so this one will do just nicely. My iPhone, because duh. My name badge and safety knife tend to live in my bag now, because I keep forgetting to attach them to my uniform. Clearly, I'm a model employee! And sweeties, in case I need a pick me up. 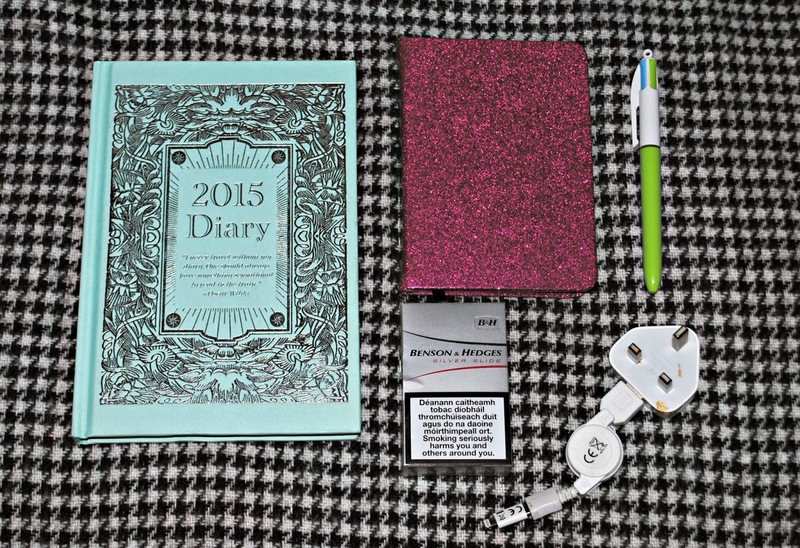 I picked up this diary in Dealz in November, when we first got them in. I had planned on giving it to a friend as part of a hamper for Christmas, but somehow it made its way onto my bookshelf, and later into my bag. It's not great, but it'll do the job. Considering I tend to use diaries for a few weeks and then forget all about them, spending megabucks on the likes of a Filofax are wasted on me. The same goes for the spangly pink glitter notebook. I start off so well, keeping good care of my notebooks, but then I need to make shopping lists, or make not of something that's ~not intended for that particular notebook~ and I lose all interest in them. A phone charger because the life on my iPhone is a complete joke. And cigarettes because I'm a dirty smoker with no intention of quitting. 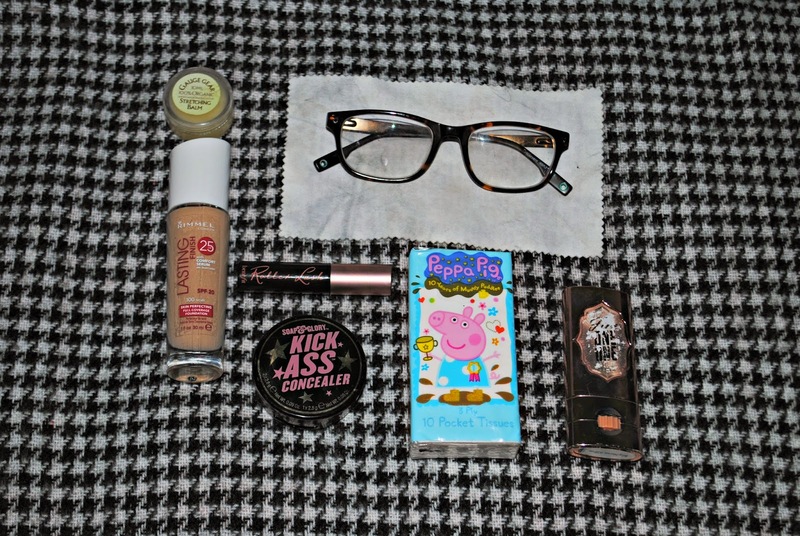 On the days I actually wear makeup, I need to have it on me at all times. I have a dirty habit of pawing at my face when I'm tired and stressed, so this ensures that my makeup looks halfway decent throughout the day. I've also been carrying around a tub of Gauge Gear since I started stretching my ears again. For ages, I was only using the likes of Bio Oil, but since this is solid, it's not as messy on application. And lastly, the odds and ends. 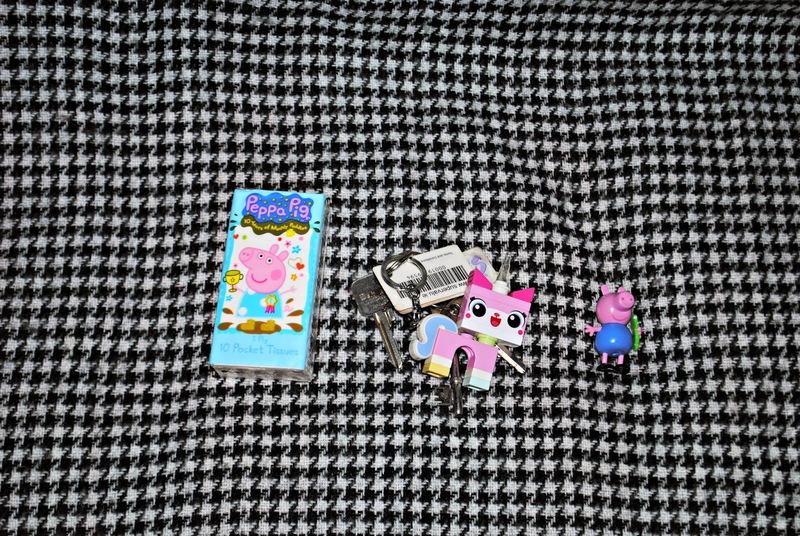 My keys have a habit of getting lost, even with my Unikitty keyring. This week alone I left my keys in my mother's house for four days before remembering where they were. I'm telling you, I'm a joke. And what mother's handbag wouldn't be without some Peppa Pig. We're constantly losing Peppa and George around here, and nine times out of ten, they've been stashed in my bag or one of my pockets. I'm looking forward for him being over this phase already! So tell me, what's in your bag? 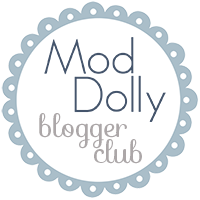 Send me on links to posts you have!